My favorite thing about these Math Scoot Games is that my students LOVE them! Now you can get ALL of my games for one low price! 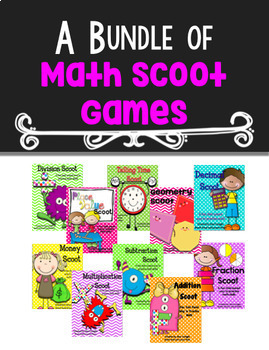 These scoot games cover a wide range of math skills and they are so versatile. Not only do they make a fast-paced game, but use them with your guided math groups, put them at math centers, or even use them for a quick formative assessment. I know your students will LOVE these games!